LightningOptics offers a full line of 1000BASE-GBIC transceivers compatible with popular brands like Cisco, 3com, Alcatel and more. 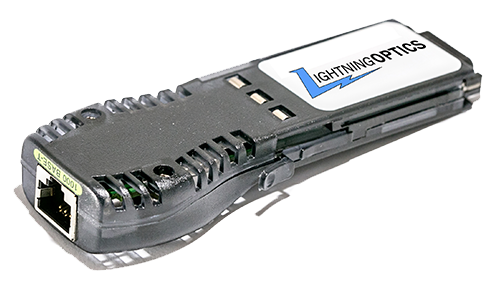 LightningOptics can provide a 1000BASE-GBIC for any of your ongoing networking needs. The industry-standard Gigabit Interface Converter (GBIC) is a hot-swappable input/output device that plugs into a Gigabit Ethernet port or slot, linking the port with the network. GBICs can be interchanged on a wide variety of products and can be intermixed in combinations of 1000BASE-T, 1000BASE-SX, 1000BASE-LX/LH, 1000BASE-ZX, 1000BASE-CWDM, or 1000BASE-DWDM interfaces on a port-by-port basis.